The photo below shows the card deck I used, along with the output of my SHA-256 hash program as printed by the line printer. (The card on the front of the deck is just for decoration; it was a huge pain to punch.) Note that the second line of output ends with a bunch of zeros; this indicates a successful hash. Card deck used to compute SHA-256 hashes on IBM 1401 mainframe. Behind the card deck is the line printer output showing the input to the algorithm and the resulting hash. Bitcoin, a digital currency that can be transmitted across the Internet, has attracted a lot of attention lately. If you're not familiar with how it works, the Bitcoin system can be thought of as a ledger that keeps track of who owns which bitcoins, and allows them to be transferred from one person to another. The interesting thing about Bitcoin is there's no central machine or authority keeping track of things. Instead, the records are spread across thousands of machines on the Internet. The difficult problem with a distributed system like this is how to ensure everyone agrees on the records, so everyone agrees if a transaction is valid, even in the presence of malicious users and slow networks. The solution in Bitcoin is a process called mining—about every 10 minutes a block of outstanding transactions is mined, which makes the block official. To prevent anyone from controlling which transactions are mined, the mining process is very difficult and competitive. In particular a key idea of Bitcoin is that mining is made very, very difficult, a technique called proof-of-work. It takes an insanely huge amount of computational effort to mine a block, but once a block has been mined, it is easy for peers on the network to verify that a block has been successfully mined. The difficulty of mining keeps anyone from maliciously taking over Bitcoin, and the ease of checking that a block has been mined lets users know which transactions are official. As a side-effect, mining adds new bitcoins to the system. For each block mined, miners currently get 25 new bitcoins (currently worth about $6,000), which encourages miners to do the hard work of mining blocks. With the possibility of receiving $6,000 every 10 minutes, there is a lot of money in mining and people invest huge sums in mining hardware. Line printer and IBM 1401 mainframe at the Computer History Museum. This is the computer I used to run my program. The console is in the upper left. Each of the dark rectangular panels on the computer is a "gate" that can be folded out for maintenance. In more detail, to mine a block, you first collect the new transactions into a block. Then you hash the block to form an (effectively random) block hash value. If the hash starts with 16 zeros, the block is successfully mined and is sent into the Bitcoin network. Most of the time the hash isn't successful, so you modify the block slightly and try again, over and over billions of times. About every 10 minutes someone will successfully mine a block, and the process starts over. It's kind of like a lottery, where miners keep trying until someone "wins". It's hard to visualize just how difficult the hashing process is: finding a valid hash is less likely than finding a single grain of sand out of all the sand on Earth. To find these hashes, miners have datacenters full of specialized hardware to do this mining. I've simplified a lot of details. For in-depth information on Bitcoin and mining, see my articles Bitcoins the hard way and Bitcoin mining the hard way. Next, I'll discuss the hash function used in Bitcoin, which is based on a standard cryptographic hash function called SHA-256. Bitcoin uses "double SHA-256" which simply applies the SHA-256 function twice. The SHA-256 algorithm is so simple you can literally do it by hand, but it manages to scramble the data entirely unpredictably. The algorithm takes input blocks of 64 bytes, combines the data cryptographically, and generates a 256-bit (32 byte) output. The algorithm uses a simple round and repeats it 64 times. 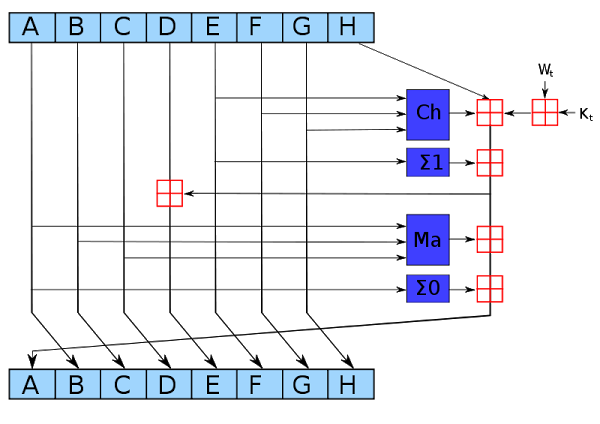 The diagram below shows one round, which takes eight 4-byte inputs, A through H, performs a few operations, and generates new values for A through H.
The dark blue boxes mix up the values in non-linear ways that are hard to analyze cryptographically. (If you could figure out a mathematical shortcut to generate successful hashes, you could take over Bitcoin mining.) The Ch "choose" box chooses bits from F or G, based on the value of input E. The Σ "sum" boxes rotate the bits of A (or E) to form three rotated versions, and then sums them together modulo 2. The Ma "majority" box looks at the bits in each position of A, B, and C, and selects 0 or 1, whichever value is in the majority. The red boxes perform 32-bit addition, generating new values for A and E. The input Wt is based on the input data, slightly processed. (This is where the input block gets fed into the algorithm.) The input Kt is a constant defined for each round. As can be seen from the diagram above, only A and E are changed in a round. The other values pass through unchanged, with the old A value becoming the new B value, the old B value becoming the new C value and so forth. Although each round of SHA-256 doesn't change the data much, after 64 rounds the input data will be completely scrambled, generating the unpredictable hash output. I decided to implement this algorithm on the IBM 1401 mainframe. This computer was announced in 1959, and went on to become the best-selling computer of the mid-1960s, with more than 10,000 systems in use. The 1401 wasn't a very powerful computer even for 1960, but since it leased for the low price of $2500 a month, it made computing possible for mid-sized businesses that previously couldn't have afforded a computer. 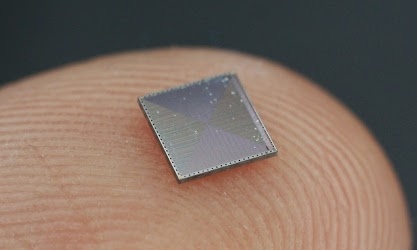 The IBM 1401 didn't use silicon chips. In fact it didn't even use silicon. Its transistors were built out of a semiconductor called germanium, which was used before silicon took over. The transistors and other components were mounted on boards the size of playing cards called SMS cards. The computer used thousands of these cards, which were installed in racks called "gates". 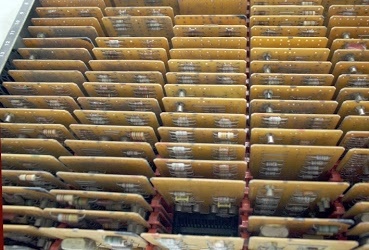 The IBM 1401 had a couple dozen of these gates, which folded out of the computer for maintenance. Below, one of the gates is opened up showing the circuit boards and cabling. 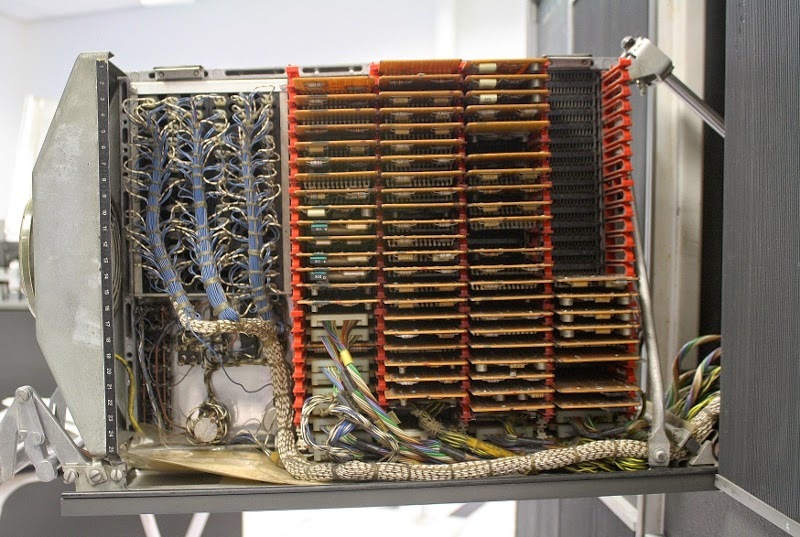 This shows a rack (called a "gate") folded out of the IBM 1401 mainframe. 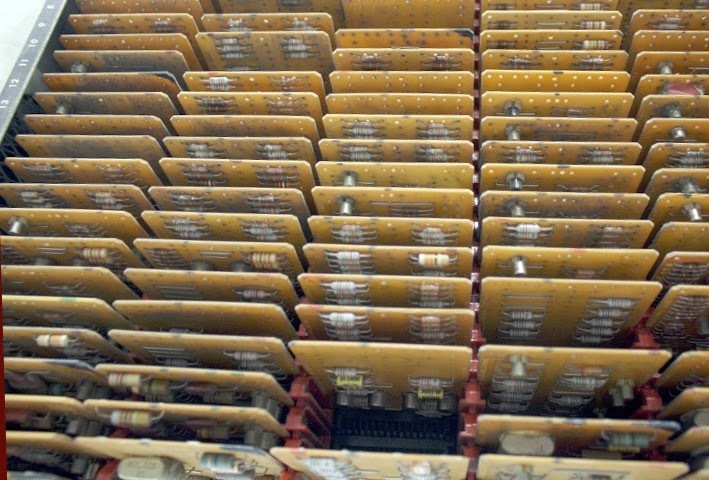 The photo shows the SMS cards used to implement the circuits. This specific rack controls the tape drives. Internally, the computer was very different from modern computers. It didn't use 8-bit bytes, but 6-bit characters based on binary coded decimal (BCD). Since it was a business machine, the computer used decimal arithmetic instead of binary arithmetic and each character of storage held a digit, 0 through 9. The computer came with 4000 characters of storage in magnetic core memory; a dishwasher-sized memory expansion box provided 12,000 more characters of storage. The computer was designed to use punched cards as input, with a card reader that read the program and data. Output was printed on a fast line printer or could be punched on more cards. The Computer History Museum in Mountain View has two working IBM 1401 mainframes. I used one of them to run the SHA-256 hash code. For more information on the IBM 1401, see my article Fractals on the IBM 1401. I ended up using one character per bit. A 32-bit value is stored as 32 characters, either "0" or "1". My code has to perform the bit operations and additions character-by-character, basically checking each character and deciding what to do with it. As you might expect, the resulting code is very slow. The assembly code I wrote is below. The comments should give you a rough idea of how the code works. Near the end of the code, you can see the table of constants required by the SHA-256 algorithm, specified in hex. Since the 1401 doesn't support hex, I had to write my own routines to convert between hex and binary. I won't try to explain IBM 1401 assembly code here, except to point out that it is very different from modern computers. It doesn't even have subroutine calls and returns. Operations happen on memory, as there aren't any general-purpose registers. * Message schedule array is 64 entries of 32 bits = 2048 bits. I punched the executable onto a deck of about 85 cards, which you can see at the beginning of the article. I also punched a card with the input to the hash algorithm. To run the program, I loaded the card deck into the card reader and hit the "Load" button. The cards flew through the reader at 800 cards per minute, so it took just a few seconds to load the program. The computer's console (below) flashed frantically for 40 seconds while the program ran. Finally, the printer printed out the resulting hash (as you can see at the top of the article) and the results were punched onto a new card. Since Bitcoin mining used double SHA-256 hashing, hashing for mining would take twice as long (80 seconds). The console of the IBM 1401 shows a lot of activity while computing a SHA-256 hash. 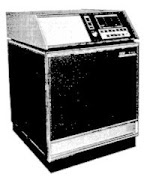 The IBM 1401 can compute a double SHA-256 hash in 80 seconds. It requires about 3000 Watts of power, roughly the same as an oven or clothes dryer. 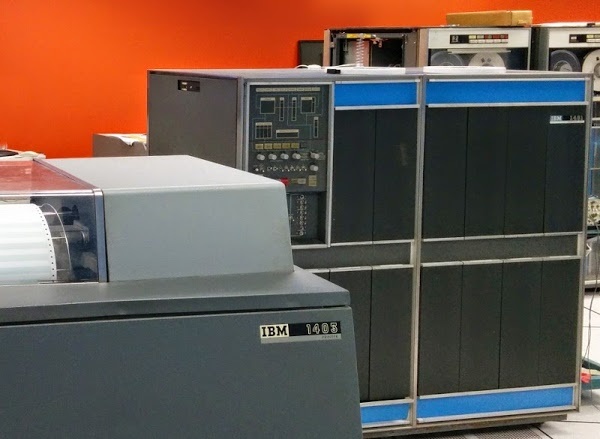 A basic IBM 1401 system sold for $125,600, which is about a million dollars in 2015 dollars. On the other hand, today you can spend $50 and get a USB stick miner with a custom ASIC integrated circuit. This USB miner performs 3.6 billion hashes per second and uses about 4 watts. The enormous difference in performance is due to several factors: the huge increase in computer speed in the last 50 years demonstrated by Moore's law, the performance lost by using a decimal business computer for a binary-based hash, and the giant speed gain from custom Bitcoin mining hardware. To summarize, to mine a block at current difficulty, the IBM 1401 would take about 5x10^14 years (about 40,000 times the current age of the universe). The electricity would cost about 10^18 dollars. And you'd get 25 bitcoins worth about $6000. Obviously, mining Bitcoin on an IBM 1401 mainframe is not a profitable venture. The photos below compare the computer circuits of the 1960s with the circuits of today, making it clear how much technology has advanced. You might think that Bitcoin would be impossible with 1960s technology due to the lack of networking. 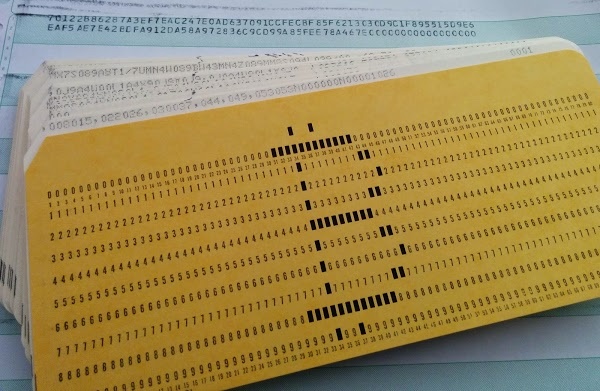 Would one need to mail punch cards with the blockchain to the other computers? While you might think of networked computers as a modern thing, IBM supported what they call teleprocessing as early as 1941. In the 1960s, the IBM 1401 could be hooked up to the IBM 1009 Data Transmission Unit, a modem the size of a dishwasher that could transfer up to 300 characters per second over a phone line to another computer. So it would be possible to build a Bitcoin network with 1960s-era technology. Unfortunately I didn't have teleprocessing hardware available to test this out. 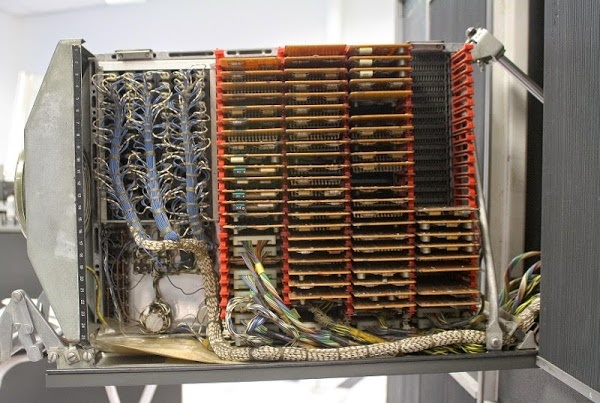 IBM 1009 Data Transmission Unit. This dishwasher-sized modem was introduced in 1960 and can transmit up to 300 characters per second over phone lines. Photo from Introduction to IBM Data Processing Systems. Implementing SHA-256 in assembly language for an obsolete mainframe was a challenging but interesting project. Performance was worse than I expected (even compared to my 12 minute Mandelbrot). The decimal arithmetic of a business computer is a very poor match for a binary-optimized algorithm like SHA-256. But even a computer that predates integrated circuits can implement the Bitcoin mining algorithm. And, if I ever find myself back in 1960 due to some strange time warp, now I know how to set up a Bitcoin network. The Computer History Museum in Mountain View runs demonstrations of the IBM 1401 on Wednesdays and Saturdays so if you're in the area you should definitely check it out (schedule). Tell the guys running the demo that you heard about it from me and maybe they'll run my Pi program for you. Thanks to the Computer History Museum and the members of the 1401 restoration team, Robert Garner, Ed Thelen, Van Snyder, and especially Stan Paddock. The 1401 team's website (ibm-1401.info) has a ton of interesting information about the 1401 and its restoration. I would like to be clear that I am not actually mining real Bitcoin on the IBM 1401—the Computer History Museum would probably disapprove of that. As I showed above, there's no way you could make money off mining on the IBM 1401. I did, however, really implement and run the SHA-256 algorithm on the IBM 1401, showing that mining is possible in theory. And if you're wondering how I found a successful hash, I simply used a block that had already been mined: block #286819. I learned Fortran in 1977 using punch cards, I feel your pain. How many cards did you have to throw away before you had the complete program? MY first computer experience was programming a Honeywell computer using cards punched on an IBM punch card machine. I had never used a keyboard before, so errors were very common, plus, the character sets weren't 100% matches (I think the IBM punch card machine was EBCDIC). I will live forever knowing that I had to punch an '&' character for the compiler to see a '(' character. I had to type '&x+3)' if I wanted '(x+3)'. Add to this, we were supposed to write and debug the program on paper, computer time was expensive, so we lost 5 points credit for every time we ran the deck of cards after the first. I really enjoy your writing, especially on the Z80, since I worked on the Z80 and the 68000 while at Mostek in the early 80s. I just finished a great book you might like. Its called "Digital Apollo - Human and Machine in Spaceflight", by D. Mindell. It covers a lot of ground about the Apollo computer and control systems, at a technical level, but you don't need to understand Control Theory to follow it. I'd call it management level. "[...]the 1401 takes 80 seconds for a single block"
I think you meant "for a single HASH"
i loved the 1401, and wished you had described it in more depth, variable length instrs, A, B, and M bits, combined op-codes (read, write, punch, and branch! ), ... but i guess that is not the point of your story. good hack! Dogzilla: thanks for the book recommendation; I plan to look at the Apollo Guidance Computer in more detail at some point. Kaos: I've update the text to make it clearer. Randy: my previous article on the 1401 went into much more technical detail, so I didn't repeat the details here. 12 minute mandelbrot? You and your high-end hardware. With a Casio programmable calculator from around 2010, it took almost an hour to fill the screen (written in pseudo-BASIC, ran at about 3 instructions per second). I'll let you know if I manage to get it doing SHA-256 hashes. Why are you attributing the increase in computational power over the ladr few decades to moores law? Moores law was an observation and prediction. Nothing else. It was the sustained effort of many engineers over thag period. It would have happened with or without moores prediction. Geoff: there's a strong argument that the existence of Moore's law in fact has driven semiconductor planning and roadmaps to stay on the curve. In other words, while Moore's law was originally an observation, now it is actually driving progress. In any case, I've changed the wording to avoid confusion. Very interesting. But for those of us of a certain age, the 1410/7010 system was much easier to understand and much more powerful. Do any working 1410s exist anywhere? Do you think that if you were implementing this in the sixties, you could mine an entire block, giving that difficulty at that time should be very low, or it actually depends on different factors? I started on 360's but the 1403 printer lived on right until the 380's when lasers took over. And punch cards lived on too with the 2540. IIRC the 1403 shared the controller with the 2540 and that still used SMS cards. And, of course, the 360's have 1401 emulation mode which was used to encourage upgrading to 360. A 1960s hashing function would have been implemented in 1960s technology. SHA1/256 is not a 1960s hash function. Cryptographic hash functions date from the 1970s. So what we'd have in the 1960s would be a simple CRC protection and then a bit more maybe. A 1960s blockchain would have set the computability bar at the level of technology within grasp. Maybe a 1970s hash function would run faster? some kind of HMAC from the early days? I have very fond memories of this computer (in the guise of a 1720 that had all sorts of D/A stuff connected to the basic 1401. I remember picking up a text book on it for a class, and I had read 10+ chapters before the first class. Was a bit "greek" to me, but by the second lecture, I was hooked and WAY AHEAD of the rest of the class. This and the Physics Dept. pdp-8 became my "friends", and I have been an avid computer "hobiest" for nearly 40 years. Really glad they have two working examples of such a milestone computer! Ken, great blog post which is rightly getting a lot of attention. I work for IBM in the mainframe team and would love to discuss this with you further. Please Tweet me @StevenDickens3 and we can share contact details and hopefully have a chat about how we can potentially collaborate on this interesting topic. You should have tried this on a Model I 1620 (CADET). Does all of its arithmetic by table lookup in memory. By the way are there really thousands of SMS cards in a 1401? I would have thought hundreds? I don't know if the history is right, or just a later embellishment of the CADET name. I wrote 2 simple programs for the 1401 back in 1970-71 when I befriended one of the programmers at the High School district office. So when can we expect the SMS card based hardwired Bitcoin computer? this question is about pool extranonce? and prof of work related to the pool? Does the pool give every pool's miner a set of the possible values of the nonce to run through ? Hi Ken: Just came across your post while reading your newer one about mining with the Alto. Do you remember that Selectric printer I had back in first year at UW (the one we used to type out our entry in the shortest APL program contest)? The interface between that and my TRS-80 used a handful of SMS cards (solenoid driver cards), interfaced to some homebrew TTL logic. shout out from Austin Texas! Just wanted to say keep up the great job! RETURN B 0 The 0 would be overwritten by the return address. The 'B-Reg' held the next instruction; by storing it immediately after taking the branch that 'calls' the subroutine, as shown here, the branch at the end of the subroutine is effectively converted into a Return-From-Subroutine instruction. Just when I tought I'm and old guy (born in 1970), I find you guys. Big big up from Italy! Your blog is awesome! "Can't Add, Doesn't Even Try" is almost certainly a backronym, where the word came first and the expansion second. But yes, there were addition and multiplication tables in low memory, exactly like the ones we learned (or used to learn) in primary school, and since there was no memory protection you could easily overwrite them and corrupt the math operations to produce the wrong answers.